AB Reynolds climbing Murray's Route on Dow Crag-Barefoot and in winter! For many with an interest in the evolution of British mountaineering the twenties appear as an out of focus blur on the distant landscape of climbing history — one of the least documented periods since the beginning of the sport. This era really belongs to the Lake District and a small band of outstanding leaders whose pioneering deeds are often little more than the cold print of first ascents at the back of a climbing guide. A. 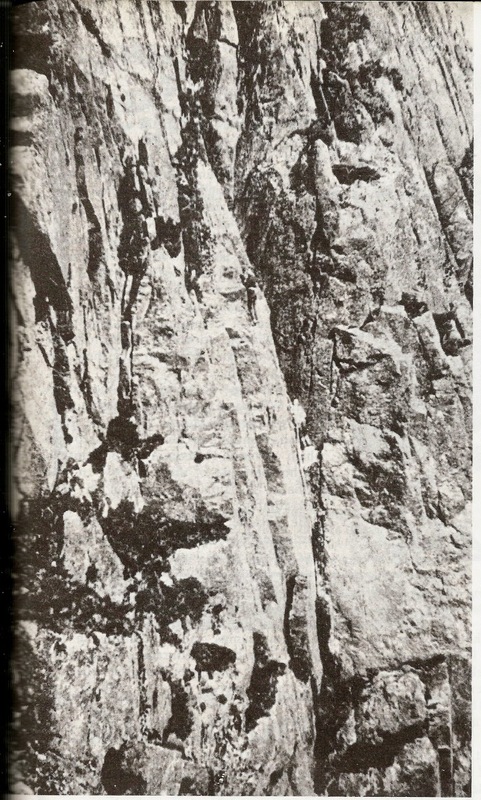 B. Reynolds was one of the lesser-known innovators of this exclusive group, and although overshadowed by the legendary Kelly and Bower, his short climbing career gained prominence more from his extraordinary capacity of leading some of the hardest routes of the day in bare feet, than from a portfolio of first ascents. These were not stunt exploits — he genuinely enjoyed discarding his footwear, feeling a greater sense of security. Even the coldest of weather appeared to have little affect on his feet, toughened by boyhood rambles on shingle beaches of the south-west and later by their exposure to the elements on his many sailing trips. Faded memories of youthful days recall a tall athletic figure, hard as teak, with remarkable stamina. Arthur Basil Reynolds, son of E. S. Reynolds, who climbed with Archer Thompson during the early days of rock-climbing in North Wales, was born in 1903 at Bridport, Dorset. He was educated at Sidcot Friends' School and continued to follow the Quaker ideals throughout his life. 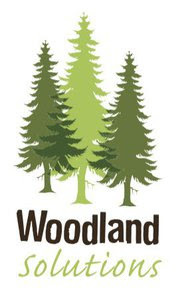 As a young man he gave expression to his creative talent by training as a cabinet maker, working for some time for Stanley Davies of Windermere, producing hand-built, household furniture of the highest quality — no nails or screws in his work! Eventually, he established his own business at Ludlow in 1946. Despite his pacifist views, he served in the forces during the second war, mainly because he found it impossible to stand aside from the sacrifice and suffering which he saw around him. He first appeared on the climbing scene in the mid-twenties and was in on the third repeats of Great Central Route and Moss Ghyll Grooves. As a leader he made his mark with an early ascent of Central Buttress (probably the fifth ascent) — he was on Bower's rope on another occasion and climbed the route barefooted. 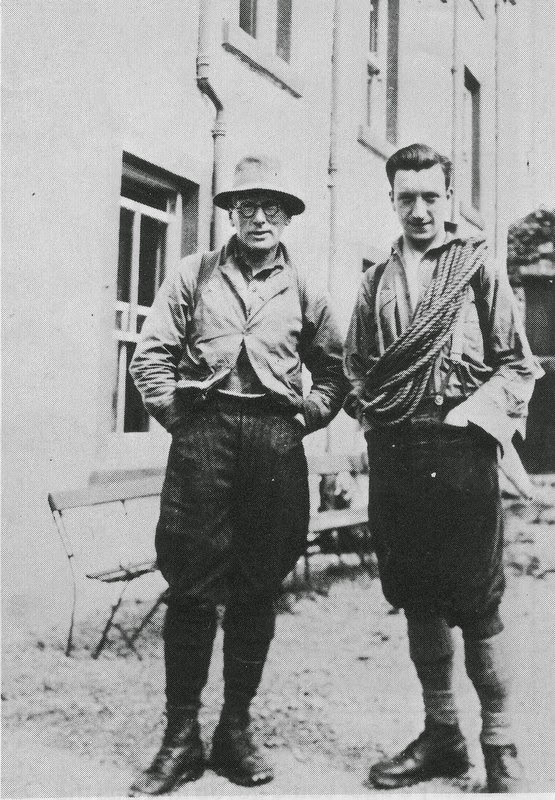 Such was the small, closely-knit, climbing fraternity of the twenties, it was inevitable that Reynolds would meet George Basterfield, one of the great extrovert personalities of those years and it was on Tower Buttress, Scafell, climbing in the rain, that ( Basterfield had painful cause to remember an outing with A.B.R. Whether he was barefooted is uncertain, but Reynolds became parted from the crux and fell outwards over his second, who fielded him well. Unfortunately, in the process, the thin Alpine line sliced through Basterfield's thumb, severing it at the centre joint. Basterfield cried, "I've lost my bloody thumb!" and despite a frantic search the detached digit was never found. Amazingly enough, the heat generated by the rope ( fused the loose skin together and no further treatment was required apart from a light dressing. George Basterfield with Harry Griffin. Fell circuits were introduced to the Lakes by Victorian mountaineers intent on conditioning themselves for a season at Zermatt; from this, various courses were devised, some of an extremely arduous nature, taking in as many tops as possible within a set time. 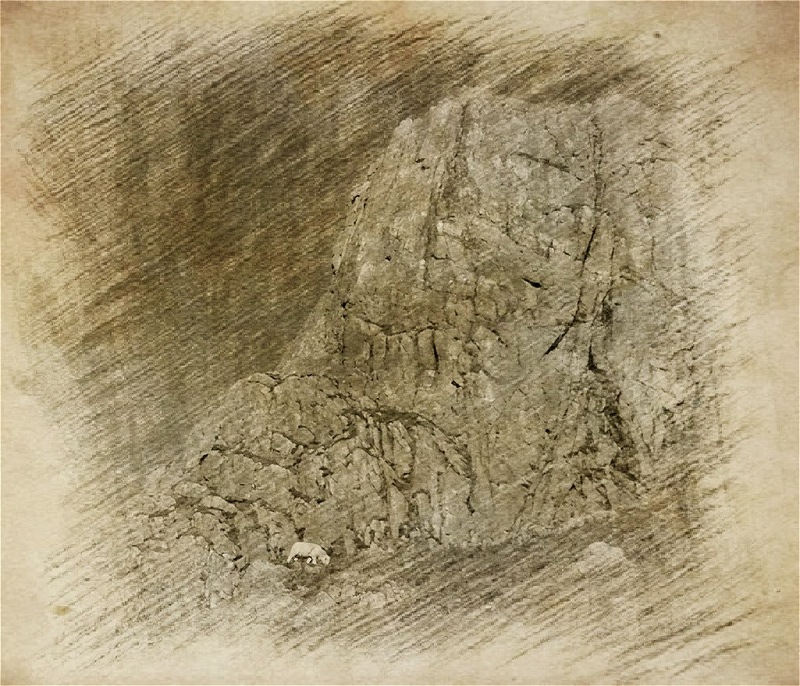 As rock-climbing developed, it seemed a natural progression for strong fell-walkers who were also rock-climbers to attempt a climb on every principle crag in one expedition. One of the first recorded tours of this type took place on July 13, 1929, when Reynolds set off on a solo excursion intending to visit as many major cliffs in the Lake District as possible. He left Langdale at 10.30 am and ascended Route 'A' on Gimmer Crag, experiencing some trouble with his nails on Lichen Chimney and losing some time through sackhauling. Kern Knotts came next and the Crack in bare feet — it would seem the long walk in warm weather via Stake, Esk Hause and Sty Head had impaired the effectiveness of his toes as they felt like rubber dummies near the top of the route. A brilliant morning gave a foretaste of a scorching day ahead and a sweaty ascent of Wall and Crack on Pikes Crag, complete with rucksack; then the north-face of Scafell was negotiated following the Keswick Brother's Climb. From the top of Scafell Pike the hump of Dow could be detected through the haze, and it was then Reynolds decided, much against his conscience, to miss-out the Coniston Group. His route to Bowfell brought a chance meeting with Arthur Wakefield, himself a walker of no mean ability and a one-time fell marathon record holder. Reynolds later wrote, "I met Wakefield, who wanted to know what I was doing wandering about by myself. To have to make such a confession to Wakefield of all people was rather hard, and although he was very nice about it I could see that he was saying to himself: 'Shades of three cairns — he's left out Dow Crag!" AB Reynolds leading The Crack, Gimmer, May 1928. The top of Bowfell Buttress was reached with only 1/2 hours to spare and he was beginning to feel decidedly dehydrated, but he managed to reverse the route in 35 minutes, which included some sack lowering. Reynolds reached the haven of the Old Dungeon Ghyll Hotel, only after a lengthy stop at the watering hole of Hell Ghyll Fall, and was greeted by a crowd of climbers from Yorkshire consuming vast quantities of beer on the hotel lawn — these lads according to A.B.R. were politely incredulous when he told them where he had been and were doubtful if he had ever left the dale. Ernest Wood-Johnson, one of the few climbing survivors of the time, tells a curious story of an incident which involved A.B.R. It was in the late twenties, while Reynolds was resting at Esk Hause, during a solitary walk on the Cumbrian fells, a stranger approached and sat down next to him. He was a young man, who looked in his early twenties, of striking appearance, with blue eyes and fair hair. His dress was characterised by a white rolled neck sweater and fawn riding-breeches — the popular climbing garb of a previous generation. For a while they exchanged polite conversation, then Reynolds rose to take his leave and started to walk away, for some reason he glanced back, the young man was no longer there — he had unaccountably vanished. It was a rather perplexed Reynolds who made his way down to the valley and told his friends about his incredible encounter, but after a while the incident was pushed to the back of his mind. Sometime later however, he was in one of the local inns, (probably the Wastwater Hotel) when he noticed a photograph hanging among others on the wall. It was a portrait of a young climber with distinctive pale eyes. " That's him," exclaimed Reynolds to his companions, " that's the chap I told about on Esk Hause." The cragsman's name was Siegfried Herford, killed during the Great War in France, several years before. 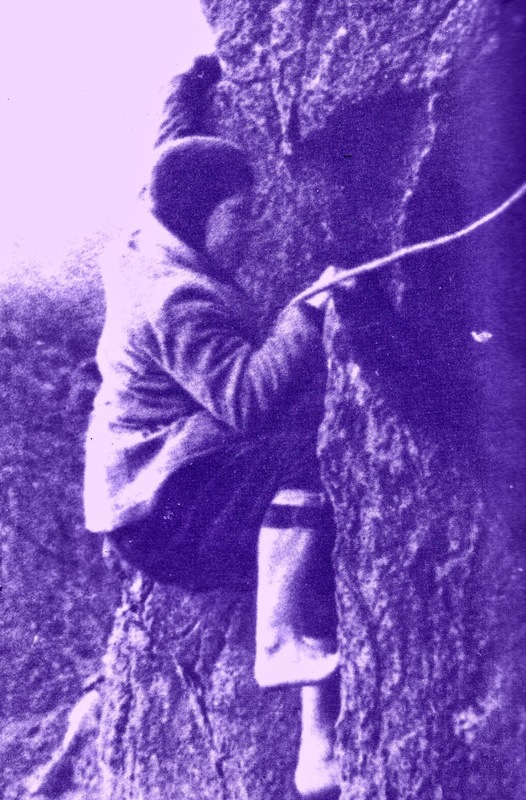 Reynolds did much of his climbing in Langdale, being involved in several first ascents. 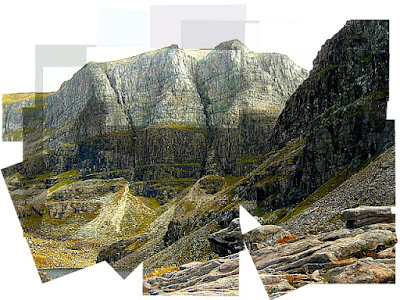 In 1928 he found Borstal Buttress on Bowfell — its name a mild debunking of the nearby Cambridge Climb. In the same year on Gimmer, climbing in bare feet, he followed Bower up Hiatus, thus completing the top pitch, led by Basterfield. Further down the north-west gully, Reynolds and Macphee were responsible for JOAS, (Just one awful sweat) and on the Alphabet Face, he supported Morley Wood's effort on Diphthong — its name denoting a sharp expletive expressed by the leader on the first few hard moves. It is interesting to reflect on the names of these routes and the play on words which they entail; possibly they evoke an atmosphere of the times — far removed from the mind-boggling titles inflicted on some of our present day climbs. But these were really 'B' movies before the main feature, for on the 5th May, 1928, Reynolds seconded by Macphee, seized the initial standing natural line, the passage had been pre-christened, The Crack, years before. The conquering of The Crack was not without its odd moment of drama — on a previous skirmish, this time in the company of H. G. Knight, Reynolds found himself teetering precariously below the final overhang with Knight on the ledge below, but unable to find an anchor. It had been a late start and the pair were in danger of becoming benighted and before rescue came in the form of a top-rope, they had ample time to admire the sunset over Rossett Ghyll and a rising moon. This pitch was led only after the removal of loads of vegetation, enabling the leader to gain entry to the crack. Why the Crack held out so long is a question worth asking — more difficult routes had certainly been pioneered. The Girdle Traverse and the Eliminates on Dow, for instance, are technically more demanding. Of course, attempts had been made; Basterfield reconnoitered the line on a top-rope and Bower was lowered to the ledge which now bears his name, but failed to lead the turf-filled crack above. It is also well to remember that the route in 1928 bore little relation to the clean, well scratched rock a modern climber now enjoys. Reynolds and Macphee spent hours in gardening activities before their final success. All this helped to create a reputation of inaccessibility. It may be difficult to believe now, but Langdale was not considered a climbing area of any great importance. 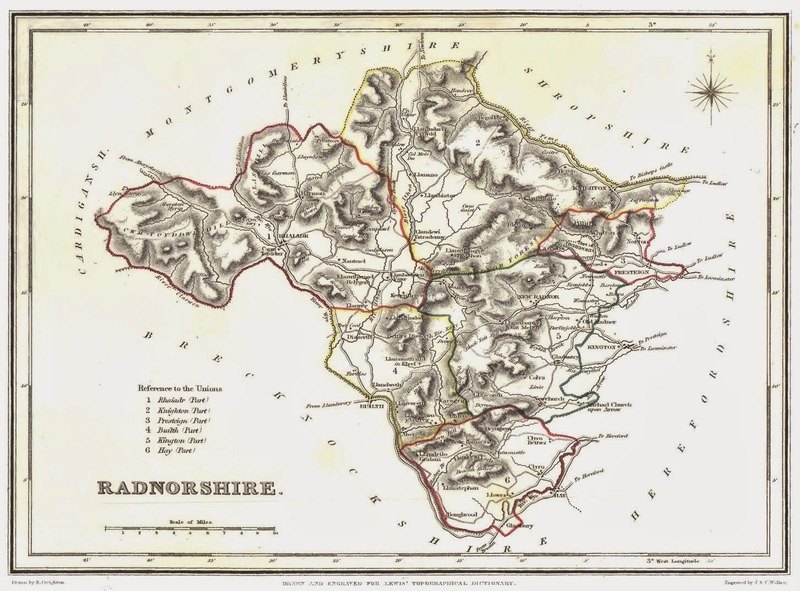 By historical right, Wasdale was still the Mecca of Lakeland mountaineering, with easy access to Pillar, Scafell and The Napes, and it was here that Kelly exerted his powerful influence on the politics of Lakeland climbing. It would appear that The Crack was born on the wrong side of the hill. Even as late as 1937 when Kelly and Doughty wrote, 'A Short History of Lakeland Climbing' including a comprehensive list of first in ascents dating back to 1826, The Crack was of not included, or given a mention — a surprising omission! After the first ascent, the new route lay unmolested for most of the summer, but on September 30th 1928, Reynolds, Bower and Macphee repeated the climb taking 2 hours, which is about an average time for today. Some undergraduates, who were watching the proceedings, enquired if the route was any good and upon receiving an assurance that it was, surprisingly showed a veiled indifference to the problems that had taxed Reynolds and company! The students who upstaged our seasoned campaigners were Ted Hicks and Charles Warren. 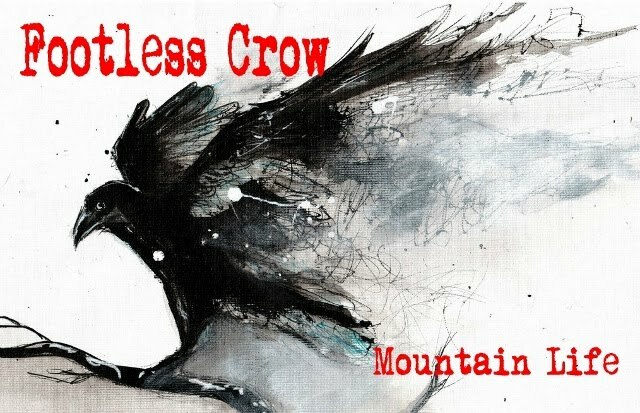 Hicks in particular was on the threshold of promised brilliance and was soon to make his name in North Wales with such climbs as Rowan Tree Slabs (HVS) and Heather Wall (VS). "Unaware of its reputation, it held no terrors for us, and we roared up it. There was a loose chockstone in the top section of the Crack and whilst trying to make it more secure, I accidently dislodged it, much to Macphee' s annoyance. At the same time I injured my finger badly which bled freely throughout the rest of the climb — I still have that scar to this day!" Historical analysis reveals that Gimmer Crack was the last great route of the twenties and the final thrust of a spent gladiator — never again were those heady years of Lakeland dominance ever to be totally recaptured on Cumbrian crags. The pendulum of exploration had swung towards North Wales and it was to stay there for almost a decade. By this time Reynolds had moved to South Wales and visits to the Lakes became less frequent. On March 2, 1930, he led a second ascent of Deer Bield Crack, a course which was soon to acquire a reputation as the horror route of the thirties — it was probably his final contribution to hard rock-climbing. He became manager of the Brymawr Furniture Makers, devoting much of his free time helping the depressed mining community, towards whom he developed a deep sense of unity. These troubled years saw Reynolds and his wife Helen organising folk dance classes, including a Morris team and they ran camps and expeditions in the Welsh mountains encouraging many of the out-of-work young men from the valleys to involve themselves with the outdoor way of life. There was little time for his own pursuits! As a Quaker, Reynolds was an unceasing worker for his faith. At one period in his life he gave himself fully to the cause, receiving no salary and existing on a small allowance based on need. Yet he sustained a peace of mind which many of us rarely achieve. He died on December 29, 1960, at the age of 57 years and it seemed fitting that his memorial service was held in Pales Meeting House, recently restored under his direction, high up in the bleak, windswept Radnorshire hills.